Free shipping. Buy direct from HP. 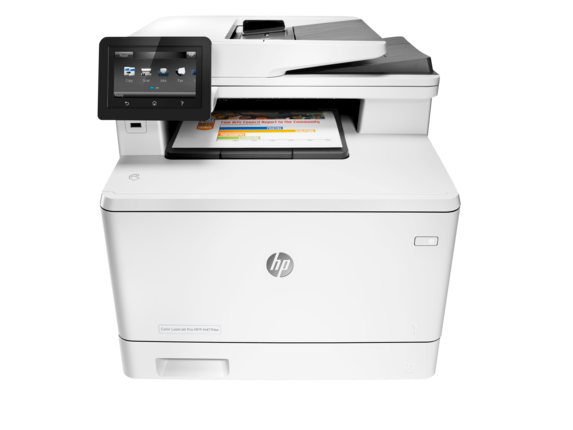 See customer reviews and comparisons for the HP Color LaserJet Pro MFP M477fdw. Upgrades and savings on select products. Scan digital files directly to email, USB, network folders, and the cloud with preloaded business apps.Grab pages and go—without waiting around. This MFP wakes up and prints faster than the competition.Breeze through multipage documents with two-sided printing that’s faster than the competition.Control access to print jobs and help keep printing safe with security features like LDAP authentication. Easily print from a variety of smartphones and tablets—generally no setup or apps required.Count on wireless direct printing in the office—from mobile devices—without accessing the company network.Help workers print with just a touch of their NFC-enabled mobile device to the printer—no network needed.Easily access, print, and share resources with Ethernet and wireless networking. When you have a high volume of documents to print, there’s no time to waste. 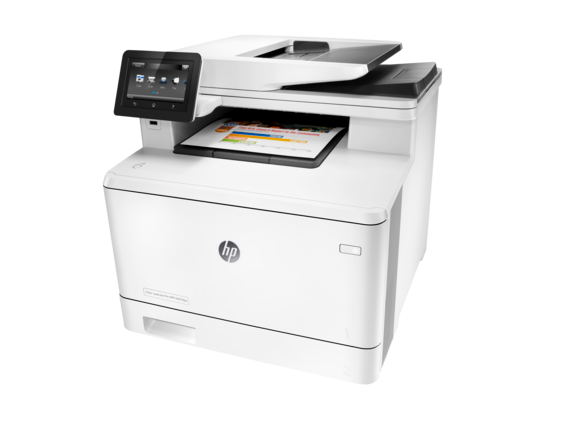 With the HP Color LaserJet Pro MFP M477fdw, you get up to 28 pages per minute in both color and black and white. Speed is the name of the game when it comes to this exceptional printer. From the second it wakes up, you get the first page out fast, letting you get on to more important things. Complex jobs slow down most printers, but not this one. Fly through stacks of two-sided documents with ease and never worry about decreased output times again. The swift response time isn’t the only feature that makes this color printer a smart choice. Customize jobs in a flash with the intuitive 4.3-inch touchscreen display. Mimicking the easy motions of your smartphone or tablet, the Color Graphic Display (CDG) interface lets you achieve personalized print results without any complicated commands. Scan, print, copy, fax, and email faster than ever before with integrated WiFi that allows for easy set-up and swift connection to all your mobile devices. 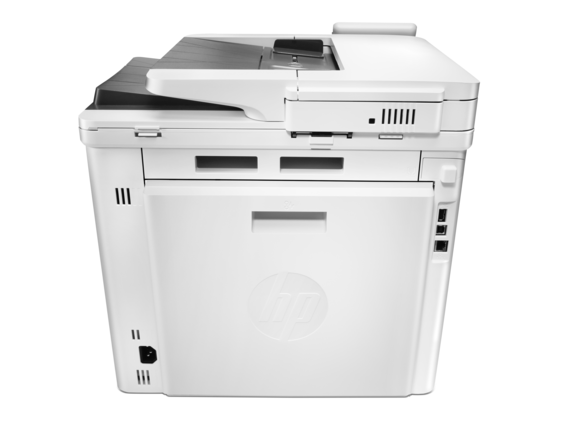 The HP Color LaserJet Pro MFP M477fdw is built to handle the rigors of daily business printing. But just because it’s quick doesn’t mean it drops the ball on the details. Whether you’re printing colored pie charts for a presentation or lab-quality photos to hang around the office, the stunning visuals this printer produces are sure to make an impact. With a standard 600 x 600 dots per inch (DPI) and enhanced resolution of 38,400 x 600 DPI, this mean machine delivers crisp lines, precise gradients, and a dizzying array of colors. Not to mention, HP ImageREt 3600 technology boosts the HP M477fdw to a whole new level of professional. While most printers rely on binary printing methods that decrease the resolution and quality of images, HP Color LaserJet Pro Printers use multi-level printing to accomplish stellar detail. HP ImageREt 3600 is able to vary the amount of each toner color to achieve the exact shade required for the print. This allows for greater quality control without long wait times. Plus, when you grab HP Original High Yield Color Toner cartridges with JetIntelligence, you can boost the number of prints you get by 48% - to a whopping 5,000 pages before you need to replace them. Utilizing page maximizer technology, JetIntelligence detects the levels of toner used in each cartridge and then adjusts the printer’s performance to accommodate each consecutive job. This smart system ultimately delivers a higher volume of documents and uses toner cartridges more efficiently to extend the life of your purchase, ensuring quality prints time after time. As our lives become increasingly shaped by technology, so do our memories. Most photos, important documents, and cherished moments exist on our phones, tablets, and computers. The HP M477fdw makes it simple to bring all your important digital keepsakes into the physical world. Print straight from your device using a variety of apps that streamline the process in just a few clicks. Need to print something while you’re out and about? No problem. Print from virtually anywhere when you send your document as an attachment to the HP ePrint email address of the desired printer. If the printer is nearby and your device is connected to the same wireless network, painlessly send print jobs through AirPrint™, HP Print Services plugins, or the HP Smart App. 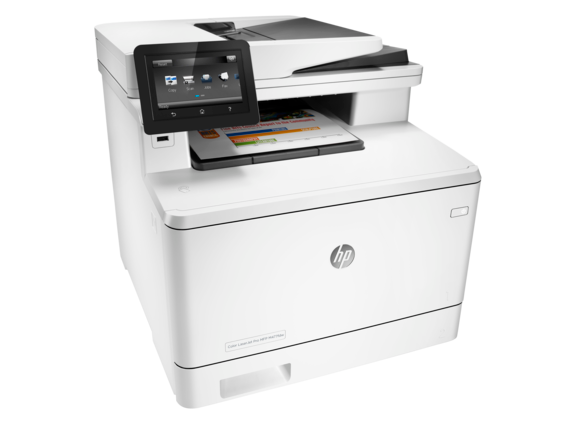 As if the HP LaserJet M477fdw didn’t already have enough mobile printing options, it’s also possible to connect to wireless direct printing when there isn’t an external network available for your device. No matter where you are or what your needs may be, you can always count of this exceptional machine to receive your print jobs and diligently execute it to perfection. Managing your HP printer is a breeze once you install the HP Smart App onto your mobile device. Send prints, order ink, scan files using your camera, and connect to other printers in a flash. Whether you work for a coffee shop or the CIA, you want your print jobs to be secure from prying eyes. Rest assured that the HP M477fdw comes equipped with a multitude of tough security measures. From a password-protected web server to firmware validation, it’s armor is thick. All your jobs are protected from the moment you turn on the printer thanks to Secure Boot. This technology guarantees the boot up code used to power on the printer is a genuine HP code. For even more behind-the-scenes security, firmware and run-time code integrity systems protect against intruders attacking your device with malicious code that could compromise your prints. IT personnel can use the HP JetAdvantage Security manager to assess and fix security issues in a single printer or across an entire fleet. Keep your security protocol consistent with this easy add-on. No matter if your project requires glossy paper, envelopes, postcards, or labels, the HP Color LaserJet Pro MFP M477fdw can handle it all. Print with color or black and white on an array of materials so all your print jobs maintain the same level of quality across the board. Not sure what types of paper you can use? Watch the magic happen with bond, brochure, colored, photo, letterhead, prepunched, recycled, rough, pre-printed, or plain paper. And because this beast is ENERGY STARⓇ qualified with a Silver EPEATⓇ certification, you can feel good knowing your lengthy mixed-media jobs aren’t racking up the energy bill. All HP printers deliver remarkable quality, but the sky is truly the limit when it comes to what, how, and when you can print on the HP M477fdw.